* Please donot add in huge attachments ( Images or Documents) here. Since its a free forum we have limited space. Images will be deleted by the moderator. *Please make your posts under appropriate forums. Have a look around first and you will see where your post belongs Do not post the same topic in multiple forums. If you are unsure of which forum a thread should go under, just state that in your post, and a moderator will move the thread to the correct forum. Multiple posts are unnecessary and will be deleted. * Sometimes you might not agree with the messages others post here. Always display a positive, friendly attitude in your posts and be respectful of others' opinions. If you think something is inappropriate please notify a moderator. * Do not use excessively large font sizes, or All CAPS as it is considered to be "shouting" and will be deleted by the moderators. * Everyone is allowed to have an opinion. Please allow your fellow members to voice their opinions. Do not deliberately start arguments. Debates are great, as long as they remain respectful! * Do not just make a negative statement and leave the person hanging out to dry. Although you may consider yourself to be an "expert" now, try to remember that we were all new and learning once upon a time. Take it easy on your fellow members! * Please don't use the forums to post large blocks of text. You can copy and paste the web site address so those interested can see the text you refer to. * Please don't use the forums to advertise your web site, or sell products. * Give people a little time to respond to your requests. There's a lot going on in these forums and it may take a little time for people to notice and respond to your request. Please be patient. * Mahaganesha Forum is not a matrimonial or a dating service, please do not make posts advertising that you are looking for a relationship. If you receive unwanted mails please let a moderator know. * Above all have a great time. 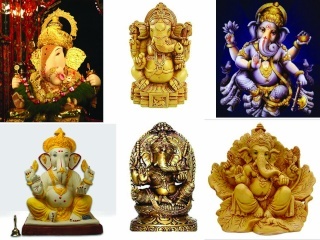 Our goal is to provide an environment where you can share, learn and discuss about Lord Ganesha and related issues.